This mod brings some features of my earlier mod Inductive Automation to Minecraft 1.11 with some changes and some new features. Its recommended for use in modpacks. Item & Fluid transport pipes where the contents are passed on from one pipe to the next along a predefined path similar to conveyor belts. Pipe Filters with many functions. Except for the usual blacklist, NBT, oreDict, etc. there is also a stock-keeping function which is often very useful for distributing items over multiple inventories. 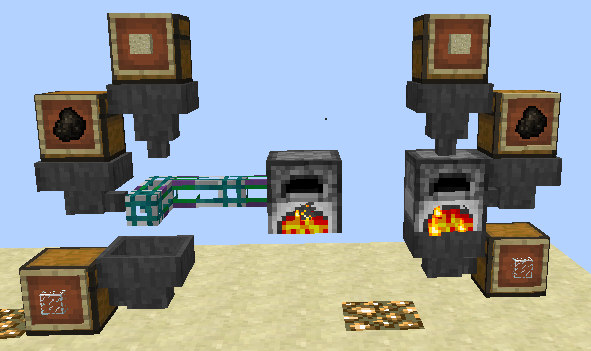 Universal Pipes for both Items and Fluids that will move them instantly to their destination without internal storage. In combination with Filters they can be very powerful. Fluid Tanks in multiple sizes that allow filling or draining fluid containers inside and can be used as fluid containers them self when harvested. Also their fluid type can be locked so they won't accept other fluids even when empty. Item Buffers in multiple sizes. What's very special about them is that you can adjust the amount of available slots in their inventory and even the stack limit to whatever you need. This also means that Items can be stacked higher than normal in there. Auto Crafter that uses a side access pattern allowing higher recipe flexibility and prevents stocking unnecessary high quantities of in-between-products (there's also a handy portable version). Portable device to remote access the inventory of a linked block, no matter where (and in which dimension) you are, as long as the block is loaded. Including filtered automatic transfer of items. High configurability: Almost everything from pipe extraction rates to tank sizes and even crafting recipes can be edited in the config file. So you can tune this mod optimally for the needs of your mod pack. I also tried to make this mod as performance friendly as possible. If you plan building massive pipe networks with a lot of items constantly moving though, there is a (server side) config option to turn off visibility of moving items in pipes to prevent network lag. Notice: not all versions of CD4017BE_lib will work. The change log description will tell you which version is required (under section Dependencies). In case you also want to install some of my other mods and they require a different version then use the newer one. It's highly recommended to have JEI installed. You can find the files here. The latest version is usually recommended unless marked as beta. You are allowed to use this mod for any Modpack, Server, Youtube Project, etc. If you are providing a copy of the mod's binary data somewhere else that is public available (public modpacks for example), please mention the Author somewhere and provide a link from where you originally got the file(s). It would be nice if there was a round-robin/random extraction pipe (for fluids and items). Currently the pipes will always send to the closest destination first, but this can be annoying when you want to use a bunch of connected things in parallel, such as a group of furnaces in a super-smelter. This is a great mod! My only issue is that sometimes when I load my world, some pipes will be disconnected. It's usually with pipes connecting to Industrialcraft machines. Breaking and replacing the first pipe in the chain usually fixes it, or just waiting a bit. There was a similar problem some time ago with Immersive Engineering multiblock-structures that didn't have their inventory access ready within first tick after being loaded. I fixed that already, by letting the pipe wait longer before it decides whether the neighboring blocks have inventories and should be connected with, but it could be that IC² machines take exceptionally long to setup their inventory. However, better create an issue on this mod's Github page for this bug with more details on when/where exactly this happens, etc. How are the remote access pipes used? It seems they can be set up as wireless piping. No they are not wireless piping. And I think this is where all the apparent misunderstandings about this feature might come from. For some reason people seem to imply remote means wireless, but Remote Access was intended to just mean access from a distance and Pipe meaning that the connection consists out of pipes so actually being a wired connection. Maybe I should rename them to something like Phantom Access Pipe as a reference to the Phantom Faces from the mod Actually Additions which work quite similar except that these are actually wireless in contrast to the Remote Access Pipes in his mod. By the way: this feature was not inspired by Actually Additions in any way, instead it originally served as a helper feature for some Redstone controlled Item-translocators in older (pre 1.11) versions of my other mod Automated Redstone for the purpose of not needing to directly place these next to the inventories they interact with. 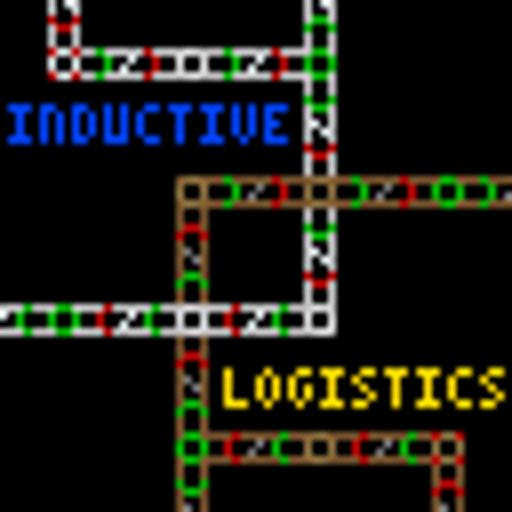 And these Item Translocators (which when I think about it had quite some similarities to ESDs) in turn evolved from the Wireless Item Translocators that were the main Item Transport feature in the earliest versions of my mod Inductive Automation (I think I already replaced that feature before the first release on curse because it was a bit too OP) and that one was inspired by the Factorization Routers in MC 1.4.7. But I also don't think that Actually Addition features were inspired by my mods because at that time my mods were way too unknown for the mod author to have likely encountered them. Ok, so not wirless piping. Still, can you explain how to USE the pipes for remote access? I only got as far as linking the pipes to a remote access tool. Thanks in advance. I have been playing a modpack that is fairly low tech with Immersive Engineering as its core and have went from despising these pipes to understanding them and almost to the liking them stage, until I spend several hours trying to set up something with the wireless access pipes, getting frustrated, coming here to see the question that was burning in my mind was already asked, and the despair when it fell short of the knowledge I needed. So, for now, they go into a chest to be lost with the other miscellaneous items until their function can be explained and a possible testing setup built to see what is required. Like I said: non wireless Phantom faces. They allow devices to interact withe the connected Block's inventory, fluid tanks, energy buffers and other things that are capability based, through the pipe blocks instead. So they don't have to be directly next to the accessed block, which is especially useful for Automatic Crafters and other machines that have a lot of different resources going in and out through different block faces. I really just don't understand how the stock function works on the Fluid pipe filter. First of all it's in m^3 which is really confusing in a minecraft environment. Second, does it take stock of the tank it's filling or the tank it took from? Third, could you use it to only allow whole buckets to go through? I was wanting to use it to stop containers from other mods having half buckets stuck in their tanks, but I don't fully understand how the filter works beyond just allowing and disallowing certain fliuds. I thought I had used m³ (cubic meters) as fluid unit only in the German localization of the mod, whereas the English version is supposed to use B (buckets) instead. I might have missed that one. If you insert the Filter into an Injection Pipe then the filled tank is stocked (never filled to a higher fluid level than specified) if you insert into an Extraction Pipe then the drained tank is stocked (never drained below the specified level). In other words: always the tank attached to the pipe is stocked and/or filtered. The same applies to fill and drain processes with Advanced Universal Pipes. It is also possible to apply stocking on the internal buffer of Transport Pipes (and thous on the throughput) by having a (filtered) Injection Pipe fill into a nearby Source Pipe or Transport Pipe as if it was a normal tank. You can achieve this by splitting the connection only on the Source/Transport Pipe side. A filter type specially intended to control throughput is planned for the future and would additionally allow things like distribution by a fixed ratio or ensuring that fluids/items are only drained or filled in packets of a fixed size. Is there a trick to getting Universal pipes working? Using v1.2.1, I have the extraction and injection pipes added to the end of the universal pipes, each connected to a chest. Nothing will extract from the chest and be transmitted. Tried with and without filters, making sure the extract/inject ends are enabled (right-clicking to remove the X), tried buffers instead of chests... nothing seems to work. To answer my own question for others, I read the description VERY close, and it's spelled out there.. You use a Item Extraction Pipe on one end and Item Destination Pipe on the other end, not a Injection pipe. How does the cover system work? I cant place it in blocks and I can't place blocks over the pipe. Put the block in your off-hand, then right click the pipe and it will be covered using that block. To remove the cover in survival, left click the covered pipe and the block will pop off. In creative, with both hands empty, right click the covered pipe. Was hoping for a alternative to thermal pipes. But they dont seem to behave properly, weather its by design or not i'm not sure. I have injection pipes connected to 3-4 inventory's but the items seem to go to the first inventory and when that inventory fills up everything comes to a stop, when there is perfectly usable space the next pipe over. If this is a bug, i can file a issue for it. UPDATE: i worked around the items not passing along by adding buffers at every junction, not exactly ideal but it works. That said, i have the same problem with fluid pipes they go to the first inventory but not the next and no buffers for fluid. Seems that you have problems with the fact that these pipes don't support forking the transport path. Each pipe can only have one direction where it passes its contents on to (except for injection pipes which additionally output into connected inventories first). The intended way of filling multiple inventories is laying out a pipe that bypasses each of them one after another with injection pipes. You could then also use filters on them if you want to specify what items/fluid should go into which inventory/tank or use the stock keeping setting to limit how much stuff should be filled into each of them before serving the next. This setup can actually be seen above in the demonstration image, too. And that there are no buffers for fluids is also wrong, these are called tanks. Having some trouble with the Remote Access Pipe? Is it supposed to function like a wireless pipe? It seemed to drink all my lava from my "Fluid tank Large" although it was the only pipe connected and the only remote access pipe that had been placed in the world. Is there some way to link it to another remote access pipe or am I just doing it wrong?